It’s a good idea to review your Preference settings to make sure your instructor has information which correctly identifies you. It’s also important to review your Time Zone setting to make sure assignment and quiz due dates & times are not being incorrectly displayed for a different time zone. 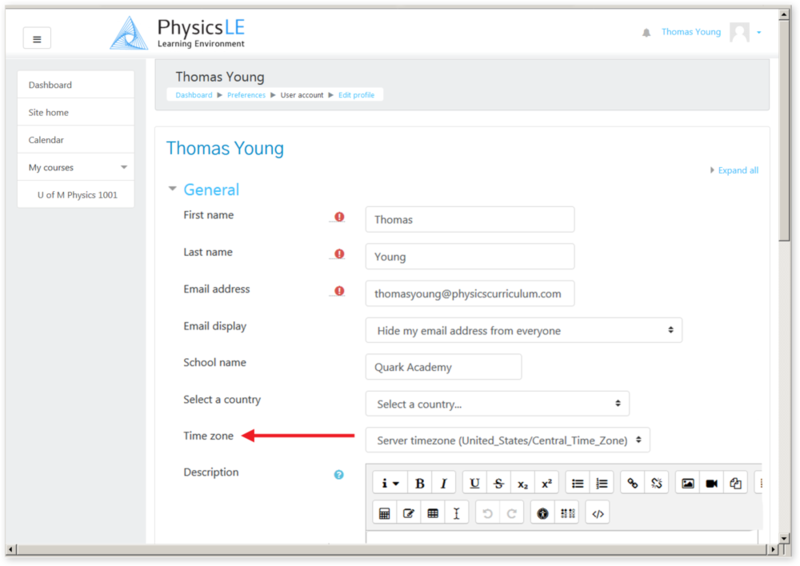 Click on your name in the upper-right corner to display the User Menu (this can be done from any page within Physics LE). Select Preferences from the menu. Click on your name in the upper-right corner to display the User Menu, then select Preferences. On the Preferences page, select Edit profile. Review your information and make any necessary changes. Pay careful attention to the Time zone setting.